Presentation of a Paul Harris Rotary Fellowship to Rev. Ron Forster. Morpeth Rotary Club’s Annual Assembly looked at what had been done during the year and set plans for the year ahead. President Peter Scott read out the four key objectives of Rotary and thanked the Club Council and members for their support during this special 80th year. He spoke of a major rethink by Rotary International. Meetings are being held in every region to look at streamlining the rules to make it easier to encourage new members. The only absolute requirement for any club is that it must hold regular meetings. Large employers could host a satellite branch at the workplace that would promote national and international networking. Members have a right to go to any Rotary club in the world and meet like-minded people from every trade and profession who are deeply involved in their communities. Many clubs work actively with schools, it is not just an organisation for the 60-plus. The Morpeth Herald was thanked for printing articles and photographs about the work of the club. Jim Dunn reported on membership. Colin Dyson started as an associate member to see what he thought and has decided to become a full member. Two others are to apply soon. New membership information leaflets have been printed, along with a reply card for anyone who might want to join. Two pop-up banners are to be ordered. Treasurer Tony Stubbs said that over the course of the year £3,550 had been distributed to local charities. International activities have paid for two Shelterboxes for worldwide emergencies, supported medical services in Africa through Mercy Ships ,and paid for an Aquabox to provide clean water in a developing country. A total of £8,358 has been given to good causes overall. Bob Kendall was responsible for Club Service and organised the Christmas Message, given by The Rev Ron Forster. The event raised £570 to help get rid of polio worldwide. President’s Night in mid-February was a celebration of Morpeth Rotary’s 80th anniversary, with 77 Rotarians, partners and friends taking part. There was a display of photographs and memorabilia, and entertainment was by Ernie Coe. He asked that a donation be given to Scots Gap surgery instead of a fee. The annual photography contest, judged by Ed Hillier, had lots of submissions and several prizes. The overall winning picture was an airliner at 30,000ft over Rothbury in a clear blue sky. The annual general knowledge quiz for three service organisation teams was won by Inner Wheel. The Burns Night Supper was so successful it is to be repeated. Alan Clark reported on Community Service. The two fund-raising collections at Morrisons raised around £2,000. 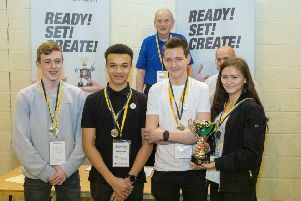 There was a lower response for the Rotary Young Writers contest this year, but more schools took part, with King Edward VI in for the first time. The Rotary Young Chef competition will run again next year. Members supported a street collection for the British Red Cross and a charity meal in aid of Save the Children. An Indian meal with the Lions in May brought in £180. It was agreed to make an urgent donation to a general assistance fund called Sanctuary Network Morpeth when the special difficulties being faced by refugees in the area became known. Members read and raised funds for Morpeth Talking Newspaper and provided stewards for Morpeth Fair Day. Some are to help with a litter-pick being organised by the Greater Morpeth Development Trust. Vocational Service uses jobs and enterprise to add resources to the community. A speaker talked to the club about growing and using sustainable willow, and arranged a follow-up visit to a growing plot near Rothbury. After a meal at a member’s house nearby, there was a fact-finding visit to the Rothbury World War I training trenches, led by staff from County Archives. Colin Briggs gave a talk on his career and his work at the BBC, followed up with an excellent visit to the BBC radio and television centre in Newcastle. International Service was boosted when Ann Thompson held a curry night at her home in October, which raised almost £1,000. This was used with a matching grant from Rotary International to re-equip a kitchen in a home for street children in Colombia. Wine tasting at Morpeth Golf Club made more than £500. The annual brass band concert in December did so well that there were not enough seats, and it raised £1,000 for Mercy Ships. Every member made a donation to the Rotary Foundation. Barry Swan organised the sporting activities, with carpet bowls and two golf tournaments. A new handicap system had to be introduced so that the best golfer would not win every trophy. Non-golfers were encouraged to join the fun by training as an apprentice caddy. Rhona Dunn reported on the Christmas Tree of Light project. It will be launched again on November 17. With help from Sanderson Arcade, many businesses and the public, it raised £950 last year, providing funding for six charities. At the last club meeting, Rotary President Peter Scott was pleased to award a Paul Harris Fellowship to The Rev Ron Forster. It is named after the founder of Rotary and is for outstanding work in the community. It is the highest honour that Rotary can bestow.